“Many people have extensively investigated the eye movement, but most of them did not care about the eye blink,” writes Tamami Nakano, as associate professor at Osaka University in Japan, in an email. “The reason why we generate blinks so frequently has been unknown.” Even scientists assumed we only blinked to lubricate our eyes. To understand why humans blink so much, Nakano and her colleagues asked 20 undergraduate students to watch “Mr. Bean” videos for 30 minutes while in an fMRI. (The students watched the popular British comedy because it's easy to follow without sound.) The researchers counted the blinks by measuring pupil size with near-infrared light; when someone blinks, pupil size is zero. Nakano and her colleagues found that when we blink while paying attention to a task, we’re resetting our brain. Think of it like rebooting your computer. When we engage in a task, such watching a movie, our brain's attention networks are triggered. Researchers once believed that as we performed an activity, our default network of the brain (which works during downtime and is responsible for those self-reflective thoughts about what we had for breakfast or when we might go to the grocery store) lessens its activity. Researchers including Dr. Marcus Raichle, professor of radiology and neurology at Washington University School of Medicine in St. Louis and the editor of this paper, found that when doing tasks our brains switched from default mode network to the areas of the brain responsible for the activity, in a see-saw-like manner. Tamami’s study finds that a blink switches the brain from the dorsal attention network, which helps someone attentively watch a “Mr. Bean” episode, to the default mode network, showing that the default mode network might play more active roles in various tasks than previously understood. 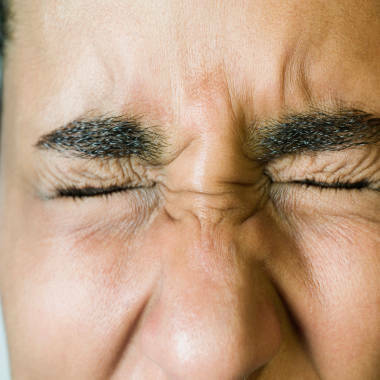 This only occurs when we unconsciously blink; we can’t force our brain to switch networks by blinking. “This blinking might occur at predictable points in a story, so does this say something about the way the brain is engaging a story or movie?” Raichie wonders. And it increases what experts know about blinking and the default mode network.